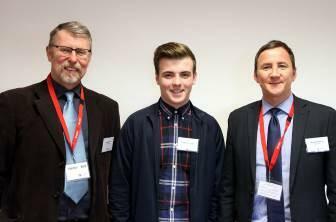 This year’s recipient of the Meldrum Joinery Scholarship at Perth College UHI is Scott Farnington from Blairgowrie. Scott was chosen from many other applicants due to his impressive drive and determination to succeed in our sector and all round excellent application. Congratulations Scott! Scott is pictured with Mike Guild and Derek Petterson of Meldrum Construction. This entry was posted in Community and tagged Joinery, Perth College, Scholarship.